Friends share. Whether it’s recipes, gossip, or financial advice, most people often pass on what they’ve learned to their friends. But the smart friends get rewarded for all that sharing. 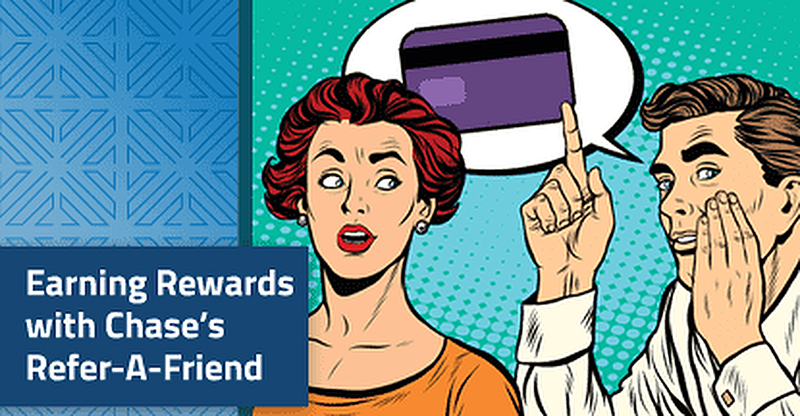 With Chase’s Refer-A-Friend program, you can earn bonus credit card rewards simply for, you guessed it, referring a friend who signs up — and is approved — for an eligible Chase credit card. Of course, the keyword here is “eligible.” Only a handful of Chase cards qualify for the Refer-A-Friend program, though the list does include several of the top Chase cards. The Chase Freedom® and Chase Freedom Unlimited® are the bank’s main consumer cash back credit card options. The cards are some of the more popular cash back cards among credit card aficionados, and either would be a fitting recommendation for many consumers. However, although part of the same card family, only the Chase Freedom Unlimited® will earn you a bonus: $100 cash back, up to $500 in referral bonus cash back per card per year. The Chase Freedom Unlimited® has no bonus categories, instead offering a flat-rate 1.5% unlimited cash back on every new purchase. While both cards are popular for their complementary earnings rates, the fact that they can be used in conjunction to maximize rewards also contributes to their popularity. For example, many cardholders will use the Chase Freedom® for bonus category purchases and the Chase Freedom Unlimited® for non-category spending. The Chase Freedom® Credit Card is one of the few cards with quarterly rotating cash back rewards categories. Once the category is activated, users can earn 5% cash back on all category purchases, on up to $1,500 in qualifying purchases each quarter. While categories vary from year to year, most bonus rewards categories include useful purchases like gas, groceries, or online purchases. Each quarter also includes a subcategory that can be worthwhile, such as purchases made with digital wallets. At the same time, perhaps one of the most appealing features to current Chase cardholders is the fact that the rewards earned with a Chase Freedom® or Chase Freedom Unlimited® card can be turned into Ultimate Rewards® points if you also own a card that already earns those points. Ultimate Rewards® points are highly valued by many cardholders thanks to their flexibility, particularly when it comes to the ability to transfer points to 10 different hotel and airline loyalty programs. Hands down two of the most popular travel credit cards on the market, the Chase Sapphire Reserve® and its older sibling, the Chase Sapphire Preferred® Card , both offer the high-value Ultimate Rewards® points on every purchase, making them an ideal referral for most anyone who travels (or wants to do so). While the high annual fee of the Chase Sapphire Reserve® might be intimidating to some, the $300 annual travel credit neatly cuts it down to a manageable size. Add to that the Priority Pass™ Select membership that gives you airport lounge access and the Global Entry or TSA Pre✓® fee credit, and that annual fee disappears quickly. Even if you don’t like airport lounges or use Global Entry, so long as you use at least the travel credit, the 3X points per $1 spent on dining and travel can easily cover the rest of the fee — and then some — for most cardholders. As awesome as both cards are, however, only the Chase Sapphire Preferred® Card has a refer-a-friend bonus currently available. For every friend you refer who gets a Sapphire Preferred® credit card, you’ll earn 10,000 Ultimate Rewards® points, up to a total of 50,000 referral bonus points per card per year. For those who aren’t ready to commit to the more expensive Chase Sapphire Reserve® , the Chase Sapphire Preferred® Card comes with less than a quarter of the annual fee, though you’ll only earn 2X Ultimate Rewards® points per $1 on travel and dining. Additionally, some of the extra benefits of the Chase Sapphire Reserve® , such as the travel credit and Priority Pass membership, aren’t available with the Preferred® card. That being said, the cards do share some extra perks, including primary auto rental collision coverage, trip cancellation/interruption insurance, baggage delay insurance, and purchase protection. A hot pick for most any business owner, the Ink Business Preferred℠ Credit Card is a favorite of Ultimate Rewards® points collectors who want to earn points on their business expenses. The Ink Business Preferred℠ Credit Card offers the largest referral bonus of any Chase credit card, providing 20,000 Ultimate Rewards® points for each referred friend who opens a card, up to a maximum of 100,000 referral bonus points per year. Not only does the Ink Business Preferred℠ Credit Card allow cardholders to earn valuable Ultimate Rewards® points on every purchase, but it also offers bonus rewards in a number of popular business categories, including travel, shipping, internet/cable/phone services, and select digital advertising purchases. Furthermore, the Ink Business Preferred℠ Credit Card has a range of useful perks and benefits, including cell phone protection, fee-free employee cards, and trip cancellation/interruption insurance. More than half of Chase’s credit cards are co-branded with a hotel, airline, or retailer, and a few of those co-branded cards qualify for a Refer-A-Friend bonus. While these specialty cards are less likely to appeal to all of your friends than the more versatile rewards cards above, they may be worthwhile to those who can take advantage of all they offer. We all love to share with our friends, especially when we find something we think they’ll love. Chase’s Refer-A-Friend program offers a way to share the love with your friends — and get a little something for yourself, too. And it’s easy to share. You can refer a friend through social media, the Chase mobile app, or by using your personalized referral URL. Just remember that you only get five referral bonuses per card per year, so use those referrals wisely.